Following much criticism in the wake of four sub-standard performances for West Ham United, with his two goals, winger Felipe Anderson fired Manuel Pellegrini’s men to a pivotal victory over Sean Dyche’s Burnley in the Premier League on Saturday afternoon. Three days after the 4-2 win for the Hammers at London Stadium, we are going to analyse just how the club-record signing scored his second and third goals in Claret & Blue, the decisive strikes in the one-sided encounter and how it could have so easily been a hat-trick for him. Join us. We will start this statistics-driven tactical analysis by taking an in-depth look at his first goal in Stratford, a much-needed strike for the eventual Man of the Match’s confidence and his team’s chances of winning the match. At this stage, the score was 1-1 in the 68th minute after the hosts had surrendered an early lead on the stroke of half-time. After receiving a pass from Robert Snodgrass, scorer of the first on the day and talisman Marko Arnautovic advanced over the halfway line with the ball for West Ham. At the bottom of the first image, like all the images in this analysis, provided by our good friends over at wyscout.com, we see Anderson at the start of one of his devilish runs on the left flank. Below, Arnautovic has shifted the ball onto young prodigy Grady Diangana, who had little time to look up and assess his options, with defender James Tarkowski about to steam in, before playing the ball to his left for the No8 to run onto. 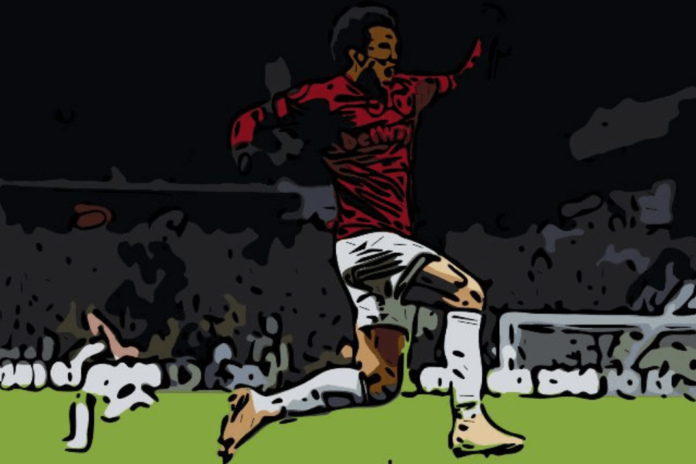 In acres of space on the left, his pace and run-timing helping him to find it on the counter-attack, the former Brazilian International has taken the ball in his stride to set up a shooting opportunity, we see him about to pull the trigger, below. Getting a whiff of a second goal since arriving in the summer from Lazio, despite shooting on his weaker foot, Anderson, with a point to prove, was not going to be denied the chance to restore the lead. As you can see, he has buried his effort beyond ex-Hammer Joe Hart and into the far left-hand bottom corner, he is about to wheel away and celebrate in front of a jubilant Claret & Blue Army. Whilst it looked like Anderson’s first goal of the game and first since the Irons’ last win, in late September over Manchester United, was going to be enough for the Hammers after already foolishly throwing away their advantage once, Burnley equalised again through Chris Wood. With seven minutes plus added-time remaining, the home side were set to throw away more league points from winning positions having held the record prior to kick-off. 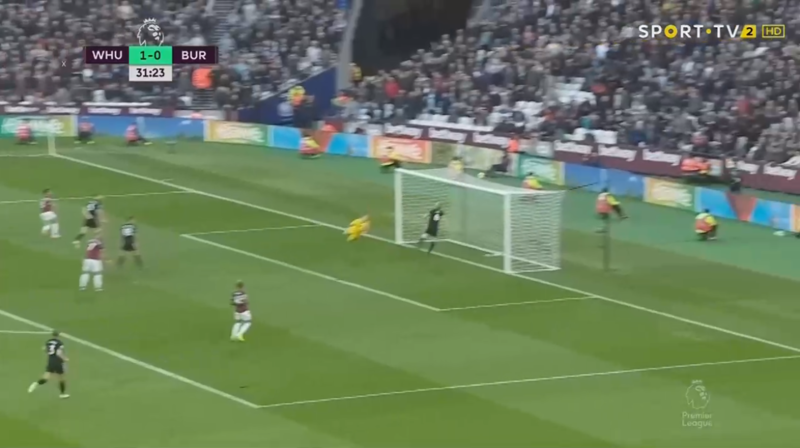 This was until Arnautovic played an eye-catching one-two with Diangana on the edge of the area to put him in the below position in such a crucial moment of the match. He has a number of options, including Anderson on his left, at his disposal. 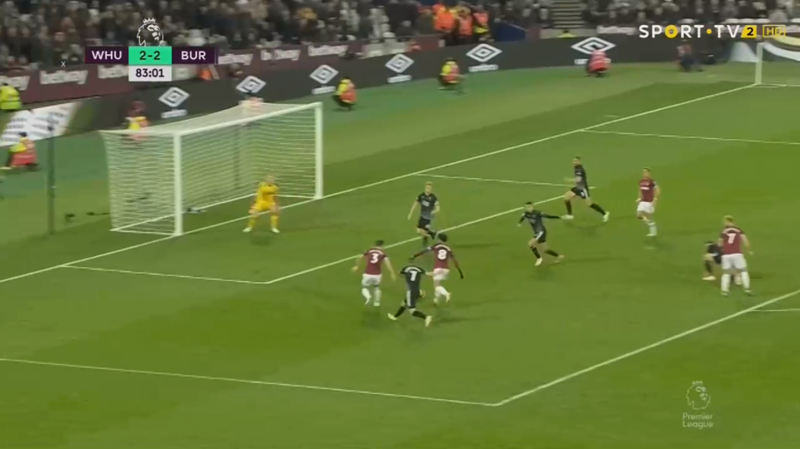 The one the 77-cap Austrian International and vice-captain goes for is the shot after working the ball onto his left foot, but Tarkowski, lucky to be on the field, deflects it into Anderson’s path. Below, we see him controlling it well, given the pace the PL winter ball was travelling at. 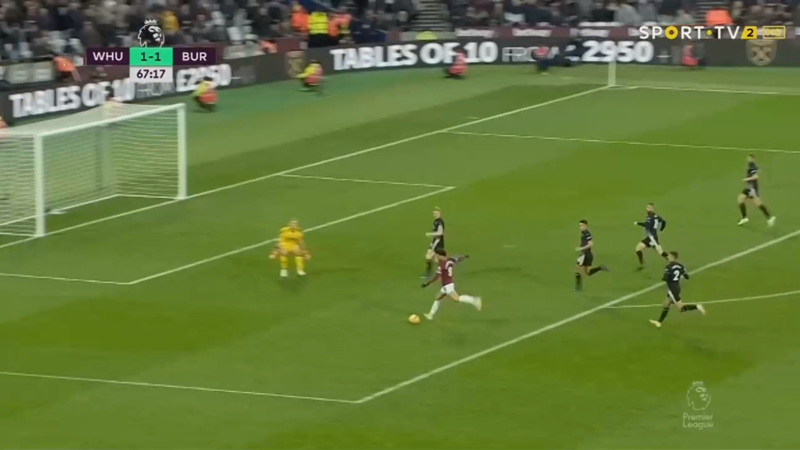 As the image tells us, left-back Aaron Cresswell is just to his left and he could play a short pass to him, however, he decides to take on the shot. The weak side-footed effort isn’t his best and it looks like Hart has it covered, but the ball has just deflected off the right boot of centre-back Ben Mee. The Englishman’s deflection wrong-foots his goalkeeper and sends the ball spinning away into the far corner for Anderson’s third Premier League strike of 2018/2019 and by far, the most fortunate, although you could argue, he earnt it. The 3-2 advantage was one that Pellegrini’s men could keep intact and even extend, substitute Javier Hernandez striking in stoppage-time to put the cherry on the 4-2 cake. As aforementioned, such was the credibility of his threat in the final third operating on the left side of the East Londoners’ front three, Anderson could have and should have scored more goals, registering three near misses. They could have made things sweeter for the Hammers fans or avoided a tense final 15 minutes, altogether. The first of them arrived fairly early on in Stratford, on just 31 minutes, when the ex-Lazio star was as keen as ever to respond to his critics, which had even included his own manager. 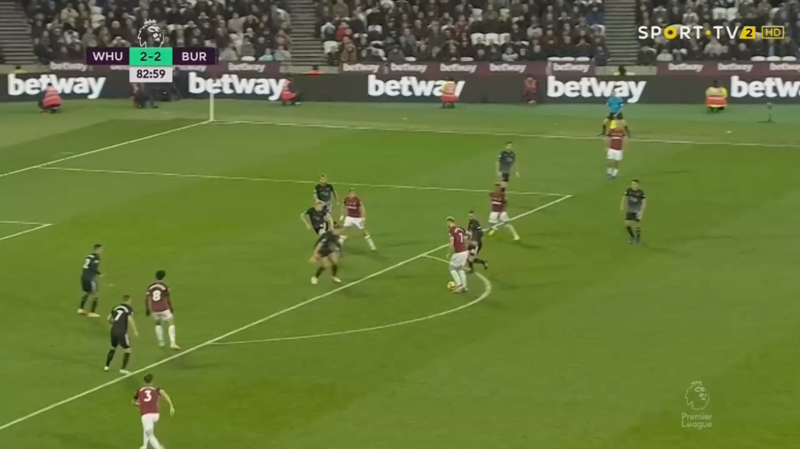 Being played in on the left side of the box by Snodgrass, his effort looking for the far top corner was perfect, beating Hart, but not beating the heroics of Mee, who we can see below flicking the ball over the bar. Our second near miss was the only one that didn’t go down as a shot on target in the Irons’ remembrance match and was a chance to put his team 3-2 up, four minutes before he did. 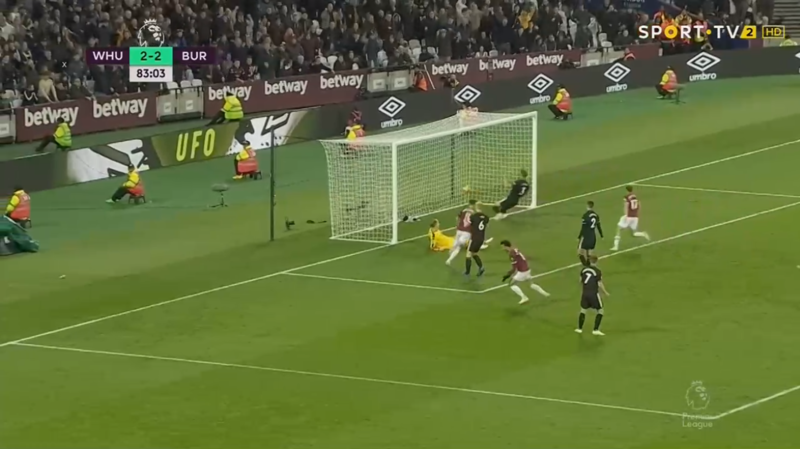 Once more, Diangana and Arnautovic had combined to slip him in on the left, his shot, we can see, about to strike the outside of the post and go out for a goal-kick. Our third and final near miss is the spurned opportunity that would have perfectly rounded off what was regarded as his best performance yet at West Ham and one of the best of his entire career. Having been teed up the clever free-kick of Snodgrass and gone for a first-time volley, below is the ferocious strike on its way to being wonderfully palmed away and out of danger by Hart. 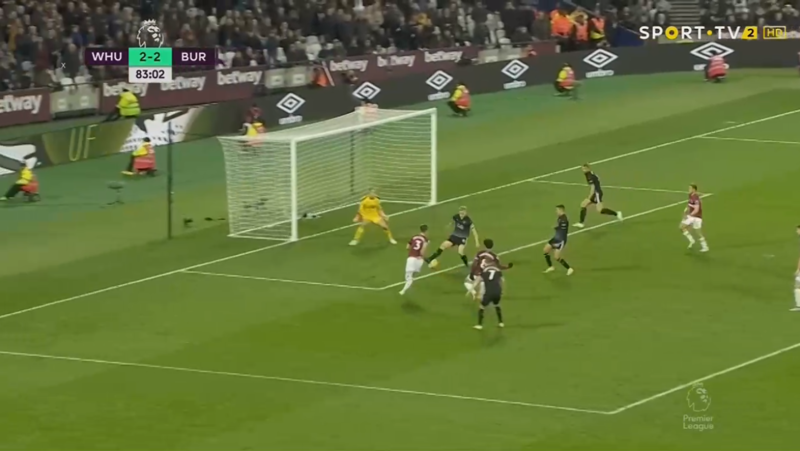 As well as being the difference between the Hammers coming away from a must-win home match they would be expected to win with three points rather than one point, these two goals would have meant a hell of a lot more to Anderson, on a personal level. He has had to take criticism from left, right and centre as his team went four matches without a victory in all competitions and his performances were poor, this display, including the strikes, would have done plenty to win over his critics from his mixed start to life in English football. The one stat that is hugely in his favour is the fact that he now has three goals a month before Arnautovic scored his first for the club, as he joined at a similar time for a club-record fee. And we all know what the No7 has gone on to do. In conclusion, our statistical tactical analysis today has found that relying on the odd stroke of luck here and there, but being unlucky himself in certain moments, Anderson used his pure ability and quality to fire the Hammers to three points of unimaginable importance against the Clarets. Points that took them just five points off the top half. However, having confounded his critics once, he won’t want to find himself in the same position again, needing a performance like this to earn back the trust of his new club. He must use these goals as a platform to reach greater heights in Claret & Blue and not go the other way, see after his goal and terrific display against the Red Devils in September.